A Birmingham school plunged into special measures during the Trojan Horse scandal has once again been rated &apos;inadequate&apos; following a damning Ofsted inspection. 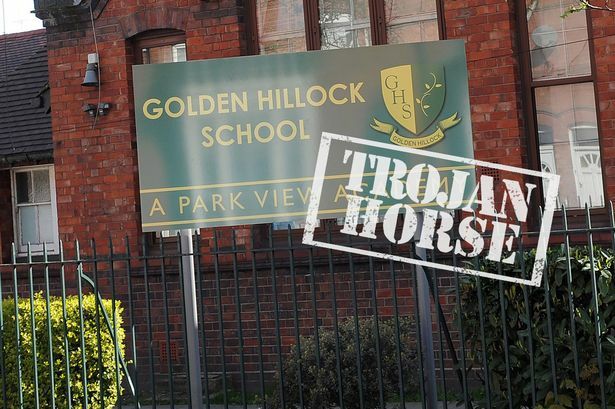 Golden Hillock School was one of five to be placed into special measures by the education watchdog in April last year following snap inspections during the investigation of an alleged plot by hardline Muslims to take over governing bodies. Since then, it has been under close scrutiny by Ofsted, undergoing three monitoring inspections. Last month, it underwent its first full inspection and the watchdog has found that "despite some improvements" in the 15 months since it was first deemed inadequate, it has once again had the same rating and remains in special measures. Pupils&apos; behaviour was criticised, as was the school&apos;s high turnover of staff and dependence on supply teachers. It comes just weeks after Sir Mike Tomlinson - Birmingham&apos;s education commissioner - spoke out about city schools struggling to recruit teachers in the wake of the scandal. The report, published for the first time today, reads: "The large number of supply staff and the turnover of staff are hindering improvements in the quality of teaching. "The leadership structure remains insecure. Some senior members of staff remain absent from work and others, including middle leaders, are still growing into their roles. Despite some improvements, the quality of teaching remains inadequate. "There is too much variability in teaching within subjects, departments and year groups." The report claimed students weren&apos;t being challenged enough, with "inadequate" pupil achievement although GCSE results this summer are expected to improve on last year. The report added: "Behaviour requires improvement. The vast majority of students like the new behaviour management system because it rewards those who &apos;do the right thing&apos;. "However, students report that the system is not always managed well by supply staff. Some students choose to make the wrong decision at times, leading to instances of low-level disruption. "Too many Year 7 students say that they do not like this school as much as their primary school. The level of challenge expected of students in Year 7 is too low. "Staff have not recognised the higher ability of students transferring to the school and raised their game accordingly." However, Ofsted did have praise for the school - particularly for "inspirational" interim headteacher Tony Wilson. It said: "He has guided the academy carefully through a turbulent period. Students, in particular, recognise the very positive difference he has made to the school and to their futures. "For many students, his leadership has been inspirational. The Trust and members of the local governing body have steered the school in recent months, dealt with very challenging staffing issues and overseen major improvements to safeguarding. "As a result, the school&apos;s work to keep students safe is much improved and is now good." The school currently run by CORE Educational Trust which also runs Nansen Primary and Park View - two of the five schools at the heart of the Trojan Horse scandal. Golden Hillock is set to be taken over by the ARK chain of academies in September when it is due to be rebranded with a new leadership team, name and school uniform. In February, a Department for Education spokesman said Golden Hillock&apos;s mover to ARK was a "significant step in ensuring that its pupils get the best possible chance to fulfil their potential". "ARK is a successful sponsor with a proven track record of improving challenging schools," he added. "It already sponsors four schools in Birmingham, all of which have seen improvement in results since becoming academies - vital experience that will ensure pupils are properly prepared for life in modern Britain."